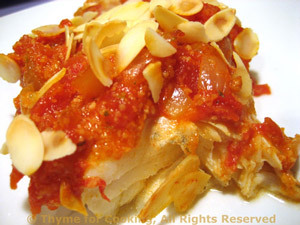 Bacalao Marinera (Fisherman's Cod), Thyme for Cooking easy gourmet dinner. The Risi e Bisi is a classic Italian first course that we are using as a side dish, It's really just a luscious, velvety risotto. Everything is quick for the end of the week. This classic Italian dish is normally served as a first course (as are all pasta and rice dishes in Italy). We think it makes a great, creamy side dish. The original is more like a thick soup, but I made this a bit thicker. Still, like all risottos, it should be creamier than the American adaptations, not holding it's shape on a plate. In medium sauce pan heat butter; add onion and sauté until transparent. When wine is almost absorbed add a 1/4 cup of stock and stir. If the peas are frozen add to the stock (not the rice) now. 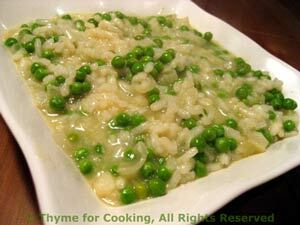 When the rice has almost absorbed the stock add another 1/4 cup stock and the peas if they are fresh. Continue adding stock, 1/4 cup at a time, and stirring. Before the last 1/4 cup is added taste a few kernels of rice. They should be just 'al dente' - slightly resistant to the tooth but fully cooked. You may not need the last 1/4 cup. If more stock is needed add it 1/8 cup at a time and waiting until almost completely absorbed. At this point risotto will be thick but not stiff - it will not hold it's shape on a plate. If using frozen peas, strain them from any remaining stock and add now. Pour into a bowl and serve immediately.